Triumph and Success may be the names of towns along our almost bi-weekly drives to Georgetown, they are also notions we are left with at the end of this whirlwind week! Our project is shifting gears towards the last stretch as students (especially the Form 3’s whom we primarily teach) enter their exams. Even though the end is near our momentum has not yet slowed- with new and exciting opportunities unfolding just this week! 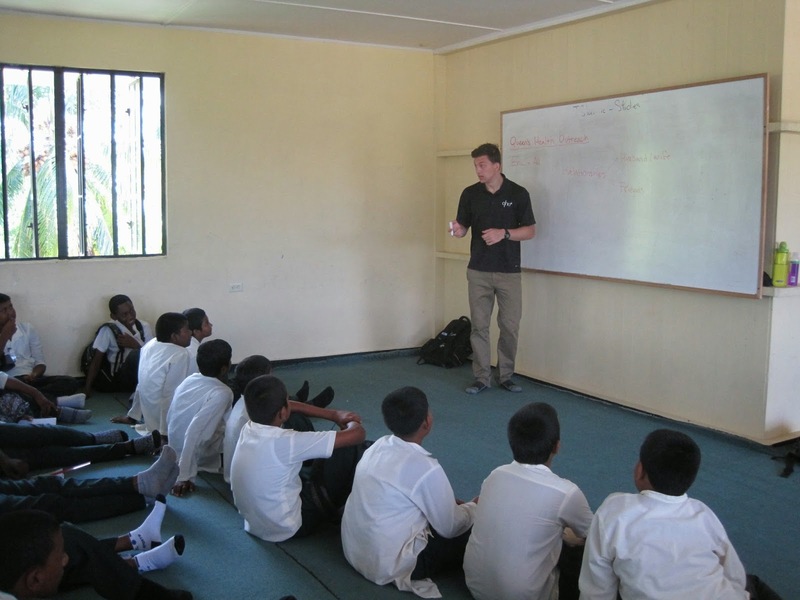 On Monday we taught our usual class of Form 3 students at J.C. Chandisingh Secondary School. 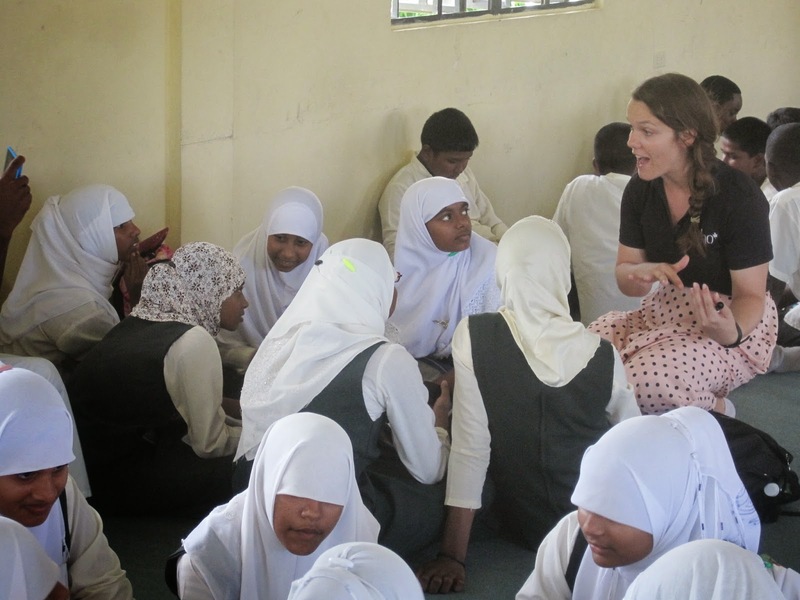 We wrapped up sexual health and answered the numerous questions from this class of about 80 fourteen year olds. Managing a class of such size means we both have to belt out our lessons. It was either our voices carrying or just word of mouth that led one of the Form 4 students to approach us as we left our lesson and ask if we could come into their class and give the Form 4 students the run down on sexual health too! We immediately agreed and started an hour long impromptu discussion on sexual health and contraceptives, ending with a girl talk/boy talk separation for discussion that we borrowed from our Georgetown counterparts. We were very excited to teach such an eager group of students in such a casual setting where we were asked to speak by those we taught! It really confirmed for us a lot of the reasons why we are here and doing this work! Getting ready to present skits on Peer Pressure and Bullying! After answering some of the questions that the Form 4 girls had, one of them mentioned that she was the President of health committee but that the committee was struggling to find people to come talk. Varsha asked if we would be interested in coming to speak and if so they would love to have us! We hope we can set this up in the next week and half because it would be a great opportunity to talk about health with youth here who are also passionate about the topic! Our whirlwind week continued on Wednesday as we made our usual hour long trip east towards Skeldon. 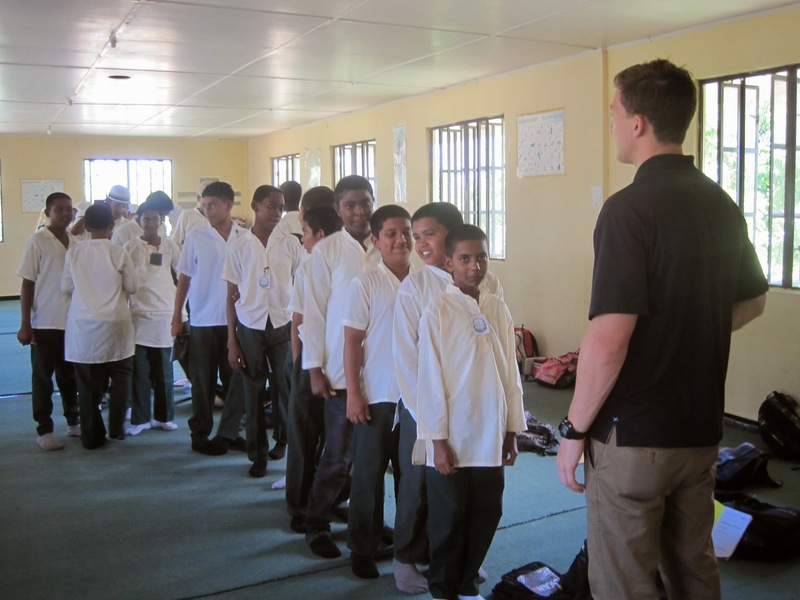 Wednesdays are a special day for us as it is the only time we teach in primary schools. It’s a great change of pace in the middle of our busy weeks, as we get a chance to loosen up a bit, and pretend we are kids once more. Over the past two weeks we have been teaching the primary students about healthy relationships, as well as peer pressure. Along with these topics we have addressed questions about bullying as well as drugs and alcohol. 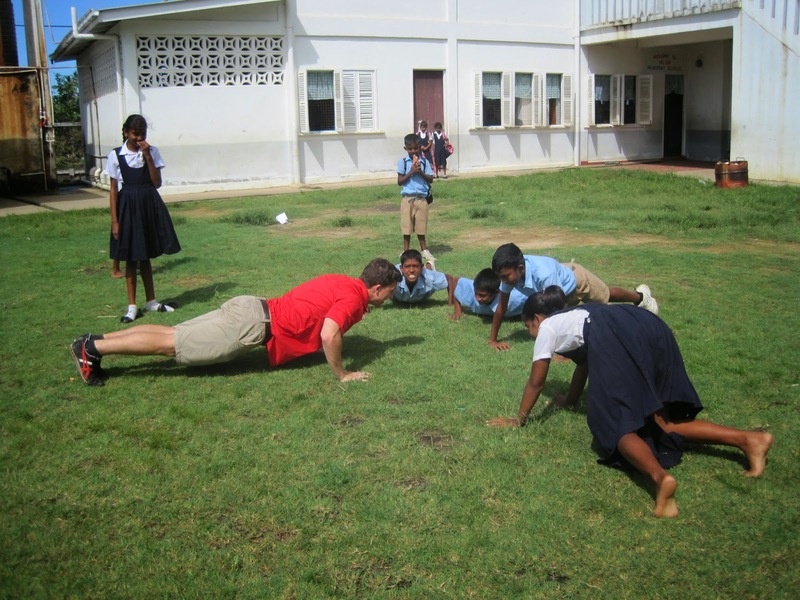 The students have been very engaged, and they have loved some of the activities and games we have shared. One of the student’s favorite activities is our “Left/ Right” peer pressure game. As the students line up single file, we offer two choices (i.e. to visit the beach – step left, or the market – step right). As students make their choices, they are often looking around or changing their mind when they see their friend’s decisions. The game is an excellent way to learn about some of the preferences the class has as well as reveal how peer pressure can work as a passive influence. Eric leading one of our favourite Peer Pressure activities! This past Wednesday offered us more excitement than usual as we were asked to speak at a monthly Parent-Teacher Association assembly. We spoke along side 3 other guests who addressed a group of 80+ parents and teachers. It was an excellent opportunity to engage with the community that we have taught in for the past 6 weeks, as well as collaborate with other educational resources. Being Thursday, today marks the start of our last week here in Berbice. Time has flown by, but we have enjoyed every minute of our time here so far. We are thankful we still have another week to teach and spend time with all our friends! I have certainly waited long enough to comment on your work down in Berbice. Although I am sure the living and eating has had its challenges, what an experience! I am very proud of both of you — which I know will not mean a whole lot to you Eric ha ha — but it is true. It takes a lot of guts to do the up front work for a project like this and then to deliver. Well done and really enjoy your last week.